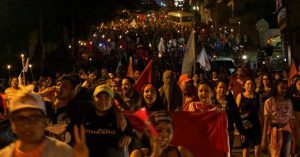 Honduras: After Stolen Election, Escalating Regime Violence, Backed by U.S.
Jesse said today: “Just in the past few weeks this regime has: stolen an election; ignored calls from the Organization of American States to hold a new election; passed a law prohibiting the prosecution of all former and current members of Congress in the midst of a series of massive corruption scandals; appointed a new national police chief who has clear evidence against him of drug trafficking; tried two civilian activists inside a military base on dubious charges; been caught paying poor residents $25 each to attend the presidential inauguration; and sent military and police to attack protests arising from the above abuses. On multiple occasions they have fired live bullets into crowds; leaving at least 20 people dead and receiving a denunciation from the UN. In this context; not a single foreign government sent a foreign minister or head of state to Juan Orlando Hernández’s inauguration. But while foreign governments may prefer to avoid photographs with Hernández they continue sending the money and arms which uphold his regime.” He also highlights an analysis by The Economistmagazine on the evidence of electoral fraud.